Estepona is flooded; many streets closed, homes inaccessible | Marbella Marbella – Adelante! 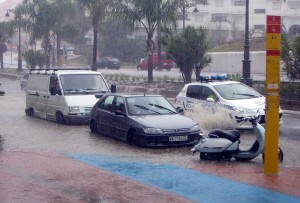 This morning’s sudden, heavy rainfall in Estepona has caused several rivers to overflow, leading to flooding in commercial areas, the town’s Councillor for Citizen Security, Francisca Bernal, has reported. A street in Estepona on Thursday morning. The affected rivers are Guadalobón, El Padrón, Guadalmansa and El Castor, while the commercial areas lie in the marina and Carmen Avenue. The water originates in Puerta del Mar and areas near the bullring. Half of the families living along the Guadalobón have been isolated, the Councillor for Agriculture, Carmen Ocaña, has said. In Manilva, with more than a dozen homes already evacuated for more than a month after suffering structural damage during the last storm, residents are also concerned about the heavy rains. Four auto routes along the Guadalobón are impassable, as well as three along the Guadalmansa, and four along the Padrón. The rivers Monterroso, Velerín and Castor are also closed. The Provincial Delegation for the Environment is marking these routes to prevent vehicle access. In addition, city authorities will close underground roundabouts along the A-7 because water has risen to the “flood-safe” level, meaning they can take no more water before flooding. Areas outlying Estepona are affected by the rain, as well. Ocaña also reported that authorities have already cut access to Forest Hills, where three homes were recently demolished due to damage from landslides during winter storms. The region of Valle del Guadalhorce is also going through a difficult day due to the heavy rainfall. In Coín, the river has overflowed Pereila, the Cantarranas industrial park, and the urban development area of El Rodeo. More than 100 litres of water per square meter have been collected in these areas. Campeones Junior in Estepona Launches Their First Ever Football Kit.